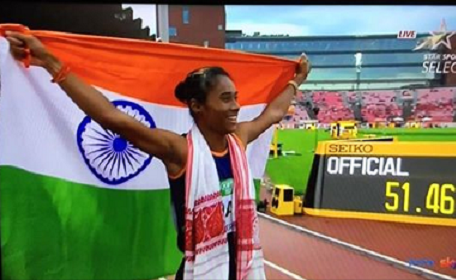 A tiny hamlet along Indo-Bhutan border in Assam devised a unique way to honour the golden girl of Assam Hima Das on I-Day. 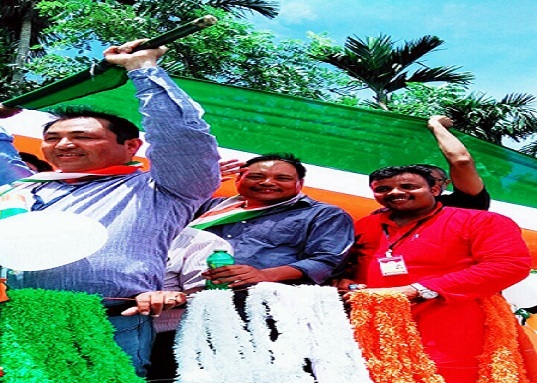 They took out a rally with a 3.5 km long tricolour to express their love and honour for Hima as well as celebrate the 72nd Independence Day. The event was organized by Sunrise Youth Club of Uparkhuti Bangalipara under Goreswar block along Indo-Bhutan border in Baksa district of Lower Assam. The club members took out a rally with the giant 3.5 km long tricolour to honour Hima and celebrate the 72nd Independence Day on Wednesday. Das said eight families of the village took a fortnight to make this giant tricolour. Rajya Sabha MP Biswajit Daimary, Tamulpur MLA Emmanuel Mosahary also participated in the rally that traversed 7 km distance in the district. “From 10 am to 2 pm we covered a distance of 7 km with the giant flag. About six thousand people from nearby villages besides Rajya Sabha MP Biswajit Daimary and MLA Emmanuel Mosahary participated in the rally,” Das said.